Powder turns Monday morning on Head Wall in Vail’s Sun Up Bowl (Vail Resorts photo). Vail snow riders skied a foot of fresh powder under bluebird skies on a chilly January day Monday — a common occurrence in years past but a rarity so far this season. Beaver Creek has seen nine inches of new snow since Saturday night. Vail is coming close to be fully open despite a below-average season-to-date snowfall total of 84 inches. Vail on average receives around 350 inches of snow during the winter months. Vail now has 28 of 31 lifts running and 183 of 195 ski trails open. Beaver Creek has received 76 inches of snow so far this season. and has 22 of 25 lifts running, with 118 of 150 trails open. Temperatures are expected to stay in the 20s and 30s Fahrenheit this week, keeping snow fresh ahead of another storm on Friday night. 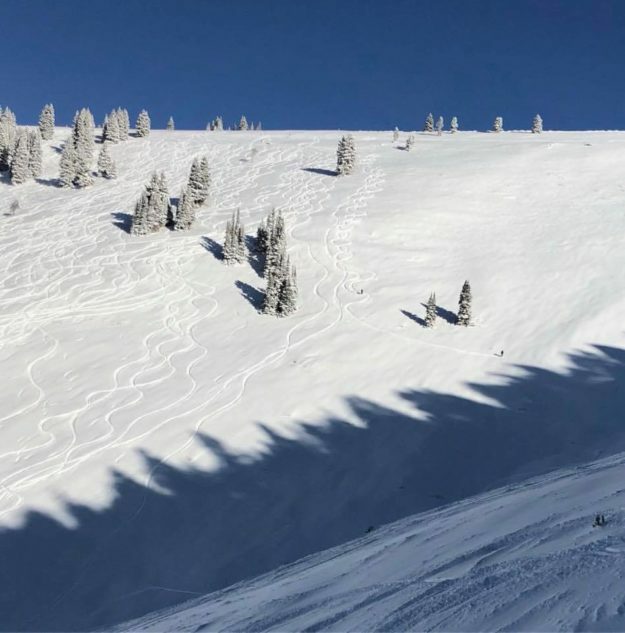 DENVER, Colo. – A winter storm ripped through Colorado over the weekend dumping nearly two feet of snow on some parts of the state, and winter enthusiasts couldn’t be happier. In addition to being the world’s premier ski/snowboard destination with 27 ski areas and resorts, Colorado also provides visitors with unmatched winter vacation experiences through a variety of unique events and cold weather activities including dog sledding, snow biking, snow shoeing, ice climbing and more. And, with more than half of the ski season left to enjoy, and the historically snowiest months of February and March are on the horizon, now is the perfect time to plan a Colorado winter or spring getaway. Below are a few upcoming winter events, lodging offers, girls’ getaways, off-the-slopes adventure offerings and more. For additional information, visit www.colorado.com. Breckenridge Pass Holder Appreciation, Through February 2: Valid pass holders can enjoy demo days, First Tracks, free EpicMix Racing, parties, live music, giveaways and more. Breckenridge International Snow Sculpture Championships, January 22 – 29: Watch as snow sculpture artists from around the world create creative masterpieces out 12-foot-tall, 25-ton blocks of snow using only hand tools. Pagosa Springs’ Winterfest, February 3 – 4: Visitors test their skills in the Anything Goes Downhill Sled Race, Penguin Plunge or sit back and watch the mass ascension of hot-air balloons in Pagosa Springs. Arapahoe Basin’s 16th Annual Beacon Bowl and Après Party, February 3: Arapahoe Basin hosts a day of backcountry safety awareness and practice at the 16th Annual Beacon Bowl. Participants will compete in a beacon search competition, be part of an avy dog demonstration and test out the latest backcountry gear from beacons to boards. Live music, pizza, beer and a silent auction are all included at the après party. Copper Mountain Winterbike, February 3: Ride into the night at the 7th Annual WinterBike race. No wheels? Guests can demo or use a rental fat bike from Reeb or Proudfoot Cycles for the race. Make it a family affair with JuniorBike, a free fun-ride for the kids. Steamboat Springs’ Winter Carnival, February 7 – 11: Steamboat has reveled in their bounty of trademark Champagne Powder™ since 1914. The carnival features ski-jumping competitions, dog-sled pulls, cross-country obstacle races and a spectacular fireworks display. Cripple Creek Ice Festival, February 9 – 18: Artists deftly use chainsaws to carve clear ice creations along Cripple Creek’s main street, while families frolic through an ice maze and sip hot chocolate. Lake City Ice Climbing Festival, February 10: Top-rope and lead-speed climbing competitions take place on Lake City‘s beautiful blue wall of ice. Winter Park Uphill Battle Debut, February 10: Experience the first ever Uphill Battle at Winter Park Resort. Earn your turns and win some incredible prizes on blue and green trails with the whole family. Ski Joring & Crystal Carnival in Leadville, March 3 – 4: A fearless skier navigates an obstacle course connected by towrope to a horse and rider galloping at top speed, and it all takes place in the middle of town, in addition to a winter carnival with other snowy activities. Breck Break: Save 30 Percent on Lodging during the “Sweet Spot” of Winter: With five huge mountain peaks to explore by day, an authentic hip mountain town to experience by night, and lively free events, ‘Breck Break’ is the perfect time to visit Breckenridge. It’s the sweet spot of the winter season when holiday crowds have come and gone, snow and terrain is in its prime, and guests can experience the destination like a local. Plus, book a ski vacation between January 16 and March 11, 2018 and enjoy all that ‘Breck Break’ has to offer including some of the biggest savings of the season, with up to 30 percent off on lodging if you book by January 31. Copper Mountain 3 Is Magic Lodging Package: Experience the magic of three. Book two nights of lodging and Copper Mountain will give you another for free. Take advantage of discounts for Ski and Ride School, rentals, Woodward Copper and tubing. Purchase lift tickets with lodging and guests will have access to the lowest priced tickets available. The “3 is Magic” lodging package is available through February 5, 2018 and includes a Kids Ski Free offering. Crested Butte Fourth Night + Fourth Day Free: Book three or more nights of lodging and three or more days of skiing between now and March 8, 2018, and receive your 4th night of lodging and your 4th day of skiing free. Keystone Kidtopia Culinary Festival Lodging Rates from $199: This winter, Keystone presents the inaugural Kidtopia Culinary Festival (February 9-17, 2018), a culinary-inspired week of family fun. The tasty week is full of hands-on food experiences and yummy treats for the kids and kids at heart. One-bedroom vacation rentals start at just $199 per night, and kids 12 and under ski free every day, all season long with just a two or more night stay. Plus, all guests booking direct with Keystone Resort receive exclusive Play for Free amenities. 20/20 Powderhorn Vision: One of the best deals on lift tickets and lodging in Colorado. Guests receive 20 percent off lodging and 20 percent off lift tickets when they purchase as a package. Packages start at $232 for a one-night stay for two. Ski Swim & Stay at Sunlight Mountain Resort: Kids 12 and under ski free with Sunlight’s award-winning Ski, Swim, and Stay family ski package. With Ski, Swim, and Stay everyone enjoys ending their ski day with a rejuvenating soak at Glenwood Hot Springs – the world’s largest natural hot springs pool – and a great night’s stay at one of eight premiere lodging properties. Mid-Season Escape at Vail: Mid-season escapes to Vail offer the lowest rate guarantee on lodging. February is one of the best times to visit Vail and experience the iconic mountain and magical villages in the midst of the Colorado Rockies. Visitors can discover a wide range of events, diverse shops and restaurants, luxurious accommodations, friendly neighborhoods and breathtaking mountain views. Winter Park Ski, Spa and Snowcat Experience. Stay and Play at Winter Park Resort. For just $59 per day guests will be able to Ski, Spa & Snowcat with 20 percent off lodging. Stay three nights and save 20 percent off each nightly rate Sunday through Thursday. Lodging discount excludes Friday and Saturday nights. Valid for stays through April 19, 2018. Many of Colorado’s ski resorts and areas offer women’s-specific clinics, lessons and events for female skiers and riders. Whether a guest is new to the sport, an advanced veteran or looking to enjoy a different kind of learning environment, there is something for everyone. Participating women will enjoy networking with fellow women, learning new skills from leading professional female instructors, and enjoying women-centered experiences. Aspen Alpine Guides’ Leave the Boys Behind: The Leave the Boys Behind program takes groups of females out for avalanche education and winter backcountry skiing and hut trips. In March 2018, they are offering a special hut trip and yoga experience that includes three unforgettable days in the beautiful Colorado backcountry ski touring and relaxing in a cozy hut with evening and morning yoga sessions taught by local adventurer and splitboarder Arielle Shipe. Aspen Snowmass Women’s Edge Program: The Aspen Snowmass Women’s Edge Program is a four-day women’s only clinic led by Aspen’s top female instructors that has been running for more than 30 years. Participants can range from intermediate to advanced, and the group can ski at any of Aspen Snowmass’s four mountains: Aspen Mountain, Aspen Highlands, Buttermilk and Snowmass. The final day includes an après party for participants. Backcountry Babes: An outdoor education program that specializes in cultivating women’s leadership in the outdoors, Backcountry Babes offers several backcountry ski hut and yurt trips, tours and avalanche classes throughout Colorado. Chicks Climbing & Skiing: Ouray, Colorado is home to one of the premier ice climbing venues in the world, and Chicks Climbing & Skiing gets females climbing in the Ouray Ice Park through their various clinics and programs. They also offer women’s rock climbing and backcountry ski programs. Monarch Women’s Wednesdays: New for the 2017-18 season, Monarch will be hosting a Women’s Wednesday Social Club. Every Wednesday, women will meet in the base lodge for a fun day of specialized tips, demo skis/boards, fashion shows, coffee, lunch, fun runs and more. Silverton’s Big Mountain Betty Fest, February 10-12: Silverton’s Big Mountain Betty Fest is an all-women heli-skiing weekend in the San Juan Mountains. The inaugural event will include expert-only skiing and riding on steep terrain, apres ski parties, giveaways and more. Telluride’s Women’s Ski & Wellness Week: The Telluride Women’s Ski & Wellness Week will celebrate the ultimate ski and yoga retreat with its 36th anniversary in 2018. Attendees enjoy a week full of yoga, meditation, wellness speakers and après fun with expert ski instruction, no matter their level of expertise. Heli Skiing: Opt for a heli-skiing adventure and fly beyond old-school lift-accessed terrain for the outing of a lifetime. Encounter the purest untracked powder on the high-alpine basins, cirques and summits of southwest Colorado with the state’s two heli-skiing providers: Telluride Helitrax and Silverton Heliskiing. Cat Skiing: Cat skiing, which involves riding in a heated snowcat to unspoiled natural terrain, is one of the best ways for skiers and boarders to seize the finest freshies. A luxury snowcat will lead guests to untracked glades, runs and open bowls on excursions with Aspen Mountain Powder Tours, Powder Addiction in Winter Park and Steamboat Powdercats. Ice Climbing: Every year, more than 10,000 climbers flock to the Ouray Ice Park in the high-altitude town of Ouray, the state’s cold-climbing capital, to ascend the more than 200 routes. Apex Mountain School offers ice-climbing courses in Vail, Leadville and Lake City that will have climbers boldly scaling the stuck-on-pause waterfall of their dreams in no time. Winter Horseback Riding: Visitors can get in touch with their inner cowboy at a variety of ranches throughout the state. Saddleback Ranch in Steamboat Springs offers trail rides through snow-dusted forests and over peaceful hills to lovely views of lumpy-topped Sleeping Giant and 10,570-foot Mount Werner. Sombrero Stables at Snow Mountain Ranch near Granby offers winter horseback rides to sights of the Rocky Mountains. Snowshoeing & Nordic Skiing: Backcountry trails lead to snow-covered valleys and peaceful stands of evergreen and aspen trees. Rocky Mountain National Park maintains dozens of these sorts of trails. Pick up a trail map from a ranger station or join a ranger-led group tour. The Brainard Lake area west of Boulder also offers an array of well-marked trails, as do the state’s many ski towns. Snowmobiling: With miles and miles of trails in nearly every region of the state, visitors won’t have trouble renting equipment and taking a ride. Some of the most popular areas include Grand Lake, Winter Park, Leadville, Buena Vista and South Fork.